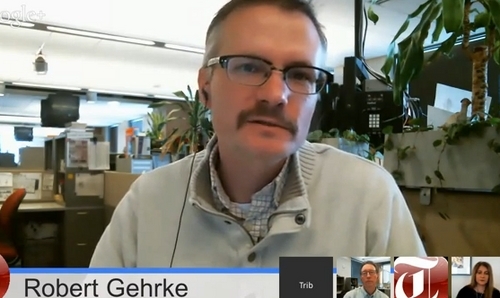 Tribune reporter Robert Gehrke on Trib Talk on Dec. 3, 2013. John Swallow may be gone as Utah&apos;s attorney general, but he won&apos;t be forgotten any time soon. Swallow officially left office at 12:01 a.m. Tuesday, but with ongoing investigations and allegations, the Swallow story will live on well beyond the first-term Republican&apos;s 11 months in office. On Tuesday at 12:15 p.m., Salt Lake Tribune reporters Robert Gehrke and Tom Harvey join Jennifer Napier-Pearce to recap Swallow&apos;s tenure, his last day in office, pending investigations and possibilities for his successor. You can join the discussion by sending questions and comments to the hashtag #TribTalk on Twitter and Google+, or submit comments in the comment section below this story.